Do you have so much money that NOTHING is off-limits? Or have you saved-up a near fortune and want to blow-it on something outrageous? Did your parents leave you a small fortune, and now it’s time to spend it all? Most of us will never answer “yes” to these questions, but it’s always fun to imagine having enough money that no amount is “too much” to spend. So, now, imagine you’re vacationing in Honolulu and have an absurd amount of money to spend on a hotel room. Where would you stay? 1. The Kahala Hotel and Resort: Here, you’ll find a 2,200 s.f. suite that costs $10,000-$12,000 per night. Yep, you read that correctly: This suite costs as much per night as most people make in months! The magazine reports that every President since Lyndon Johnson has stayed here, including President Obama. And, the executive conference table in the Imperial has been the site of many major world meetings and contract signings. Included in your stay is roundtrip airport transfer by limousine for the one- or two-bedroom Signature Suites, daily breakfast buffet at Plumeria Beach House or room service, and daily use of Oceanfront Cabana. And, get this, the magazine reports that there’s a secret doorway built into a bookshelf. The room on the other side of it usually houses secret service or nannies with kids. The Kahehameha Suite at The Royal Hawaiian is 2,732 s.f. and costs $9,500 per night. 2. 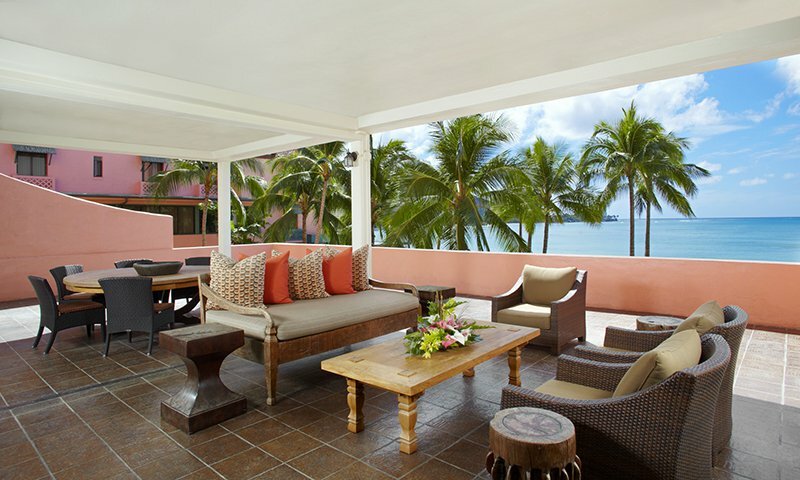 The Royal Hawaiian Kamehameha Suite (The Royal Hawaiian): The Kahehameha Suite is 2,732 s.f. and costs $9,500 per night. Honolulu Magazine reports that, here, you’ll find koa and teak floors, Hawaiian art, 26-by-38-foot lanai, a cloaked interior lanai area, a four-poster bed, Signature Luxury Collection bedding and a modern Hawaiian quilt, spa amenities. and a soaking tub with ocean view. Sign me up! 3. Halekulani Premiere Suites: You can enjoy 2,365-4,000 + square feet of luxury when you rent one of the Halekulani hotel’s premiere suites for just $7,000 per night. Choose from the Royal, Halekulani, and Orchid Suites, each of which offer an outstanding level of service. In the Royal or Halekulani Suite, you’ll enjoy nore than 4,000 square feet of space, a fully covered, large wraparound lanai overlooking Waikiki, dedicated butler services, in-suite afternoon tea service, a semi-private elevator, and a welcome amenity of French champagne and amuse bouches. In the Orchid Suite, have fun with your more than 2,300 square feet of space, Sub-Zero Wolf chef’s kitchen, and private wine tastings (by appointment). Every President since Lyndon Johnson has stayed here, including President Obama. 4. Moana Surfrider Tower Penthouse: Enjoy 1,740 square feet for just $6,500 per night! According to Honolulu Magazine, Bill Cosby, Eddie Vedder, and President Theodore Roosevelt have all stayed here, probably because of the room’s beach-inspired theme, completely redone by interior design firm Philpotts and Associates, and contemporary Hawaiian-inspired furnishings in lighter colors reminiscent of driftwood, and design elements draw inspiration from the ocean and Waikiki Beach. 5. Hilton Hawaiian Village Alii Suite: Here, you’ll find 2,000 square feet for $5,449 a night. Honolulu Magazine reports that Elvis Presley, Michael Jackson, and President Obama have all stayed here, and there are plenty of reasons why. The suite boasts hardwood floors, a dining room, parlor with connecting rooms, and a bar area which can be used for staffing private functions, among the many amenities offered. Personally, I’m still waiting to strike it rich. But, if you already have money to burn, you MUST check-out these most expensive suites in Honolulu!